Having driven past it countless times, I’m embarrassed to admit to only very recently trying out Chez Tonton. I’m a huge Francophile and I have to say I really enjoyed it. Chez Tonton is a proper old-school bistro run by the charming and welcoming Eric Michel, still hard at it after 32 years. 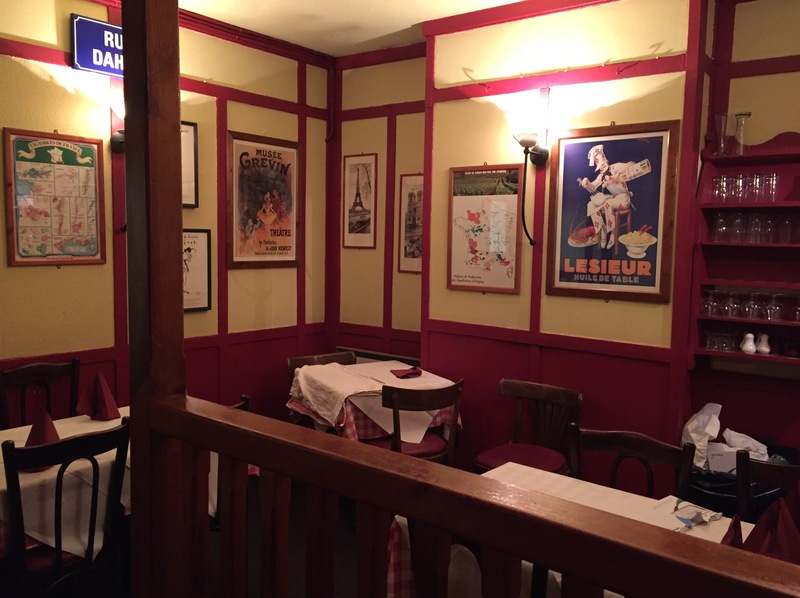 The corner site has an outdoor seating area and upstairs terrace and inside is a series of rooms furnished in true Gallic style with checked tablecloths, candles, old posters and interesting nick-nacks. The menu has classics such as onion soup, escargots, cheese fondue, duck confit, braised rabbit, but also lighter salads and fish dishes such as gravlax and sea bream cooked on the bone with star anise, pumpkin and Parmesan risotto and a couple of specials. A recent dinner began with some house Sauvignon (£4.50) and an elegantly mixed kir (£3.85) – it’s easy to be heavy-handed with the cassis. 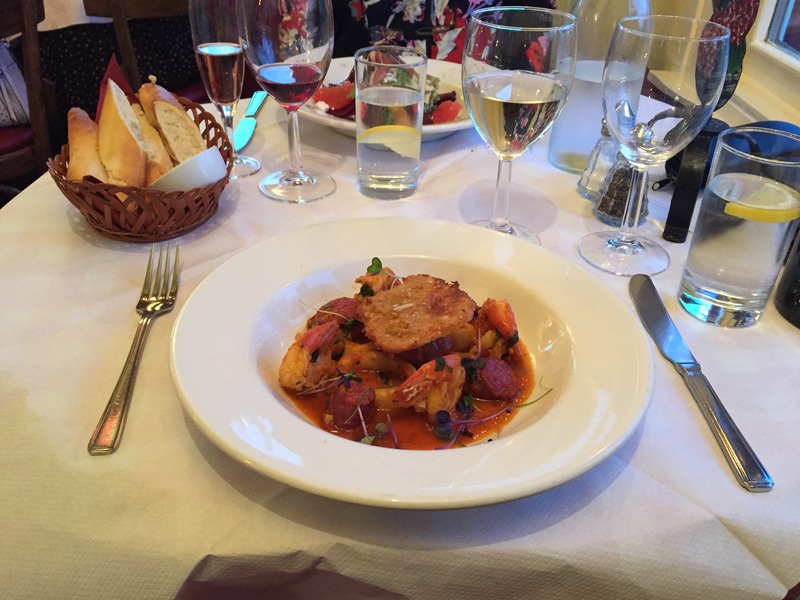 For starters my husband had one of the specials, pan-fried prawns, squid and chorizo with coriander and olive oil and a Parmesan cracker (£8.20) – deliciously rich and Mediterranean and just the thing for a cool English summer evening. My marinated beetroot salad with orange, feta, honey and smoked duck breast (£7.20) was another excellent summery choice, refreshing yet complex. 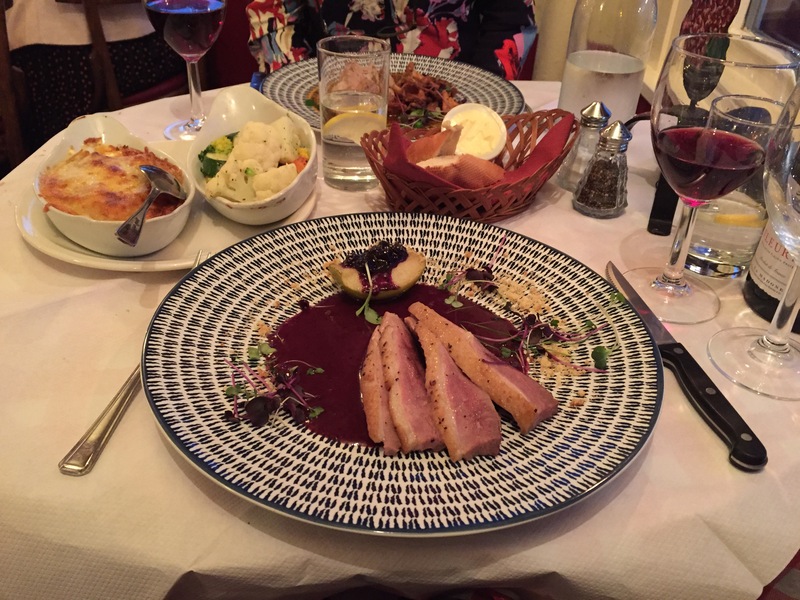 For main courses, I tried a special – pan-fried veal rump with sautéed girolles and creamy roast chicken ‘jus’ (£18.60) and my husband had roast duck breast with blackcurrant, apple, red wine sauce and almond crumble powder (£18.50). These came with dauphinoise potatoes and mixed vegetables. The servings were generous and everything was competently cooked with the occasional interesting little twist. Our juicy bottle of Fleurie worked well with the starters and mains and was one of many tempting options from the entirely French wine list. Mark ups are low with most bottles under £30 and, for example, the house Champagne is only £33.50. 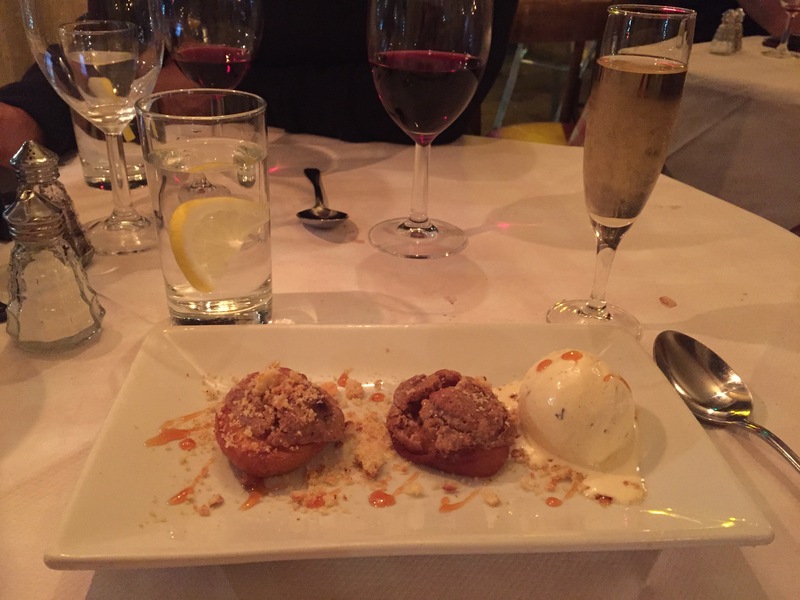 We shared a dessert of amaretti stuffed apricots (£6.60) with a glass of Muscat and enjoyed chatting with Eric. A few days later I returned to try out the set lunch with our daughter. 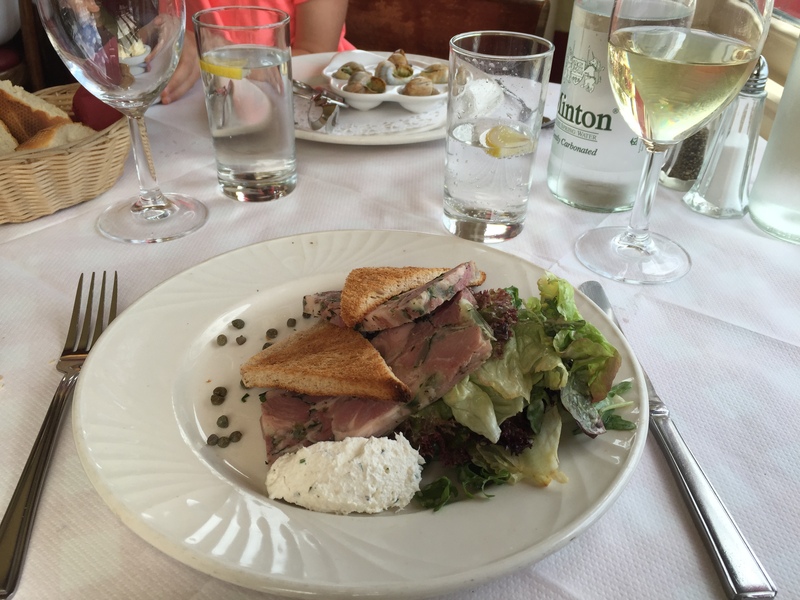 For starter she had the escargots from the main menu and I had the ham hock terrine. She quickly got to grips with the special snail holder and made short work of them. My terrine was chunky and rustic and the horseradish mousse was a nice touch. Our mains and desserts were from the set lunch (£9.95 for two courses, £11.95 for three). My poulet à la diable (spicy fried chicken) was crunchy and tasty and daughter’s salmon au beurre blanc was moist and rich, flaking beautifully. 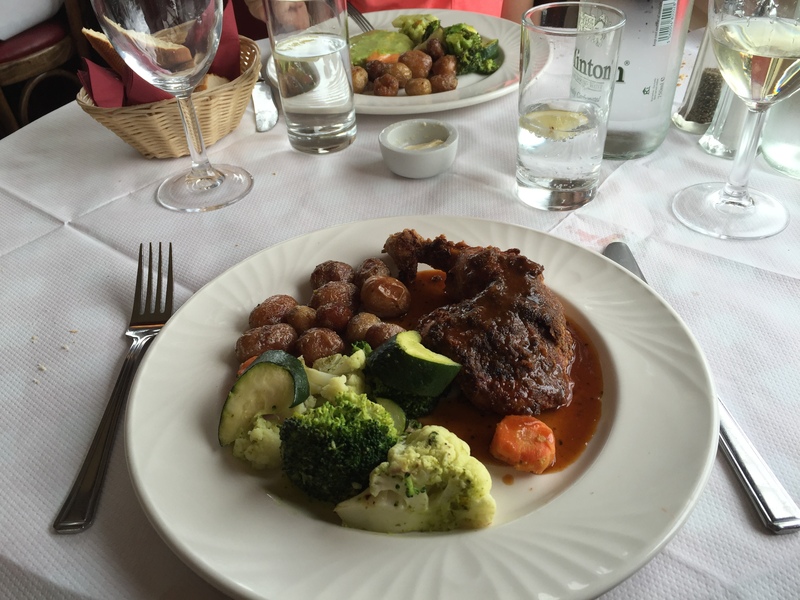 Both came with sautéed new potatoes and mixed vegetables. We finished with fruit sorbet and crème brulée which went down very quickly. 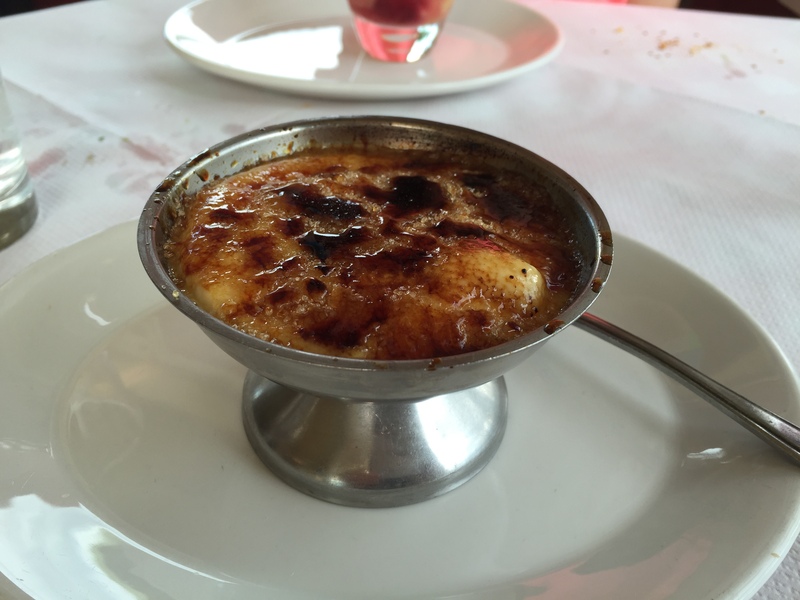 I prefer the look of a brulée in a ramekin dish rather than the little metal bowl used here, although this meant it was a smaller portion and easier to finish. 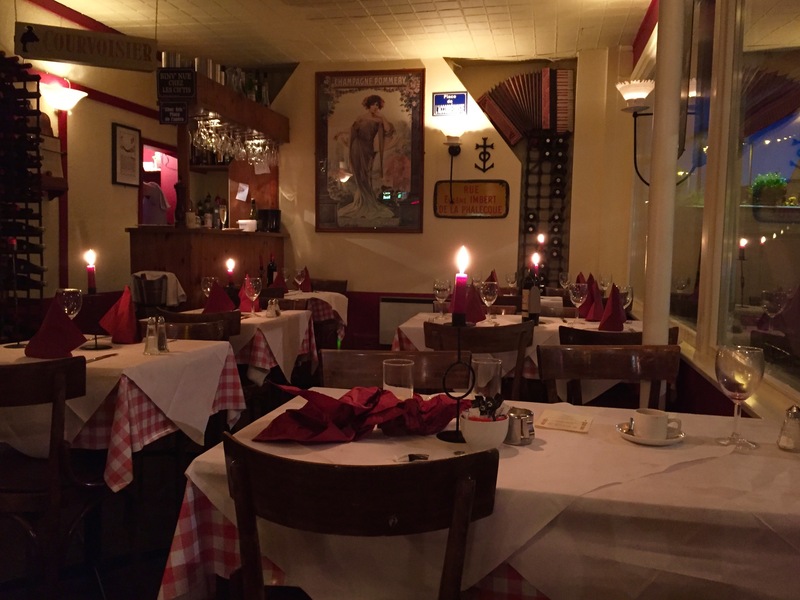 Comparing lunch and dinner at Chez Tonton, the daytime atmosphere is more business-like than the evening which is more romantic and atmospheric. 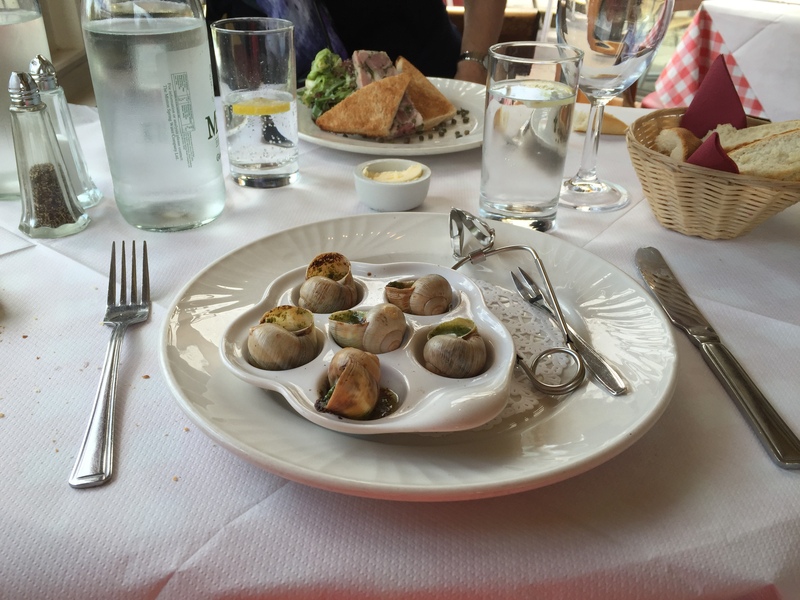 At lunchtime the French doors were open so you were more aware of the traffic, whereas dinner is more cosy and intimate made even more so by relaxing jazz music (although on July 14th you will be serenaded by accordion for Bastille Day). Bon appetit!